Computer Desk. Features Include Metal Frame With Natural Finish Shelves. Keyboard Tray. This Computer Desk Is A Very Functional Model As It Has Shelves For A Printer, Scanner, Fax Machine, CPU, Monitor, And Speakers Which Allows You To Have Everything In Place And At Hand. It Is Also Provided With A CD Holder. It Has Casters For Easy Mobility. 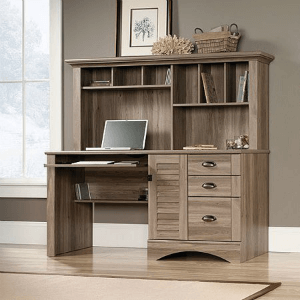 This Model Would Be The Perfect Choice For A Home Office Or Working Area. Dimensions: 42-1/2 In. X 29-1/2 In. X 55-1/2 In. Clean Desk is Metal and Glass Finish. Is only available in Silver. Size: 31.5 In. (W). x 25 In. (D). x 35.8 In. (H). Computer Desk. This Elegant And Functional Computer Desk Is The Perfect Choice For Your Working Area. It Is Provided With A Keyboard Tray, A Glass Top With Space To Place Your Monitor And Scanner, Shelf For Printer, Telephone, CPU And Speakers. It Is Also Provided With One Drawer And CD Holder. Available in Black or White.Dimensions: 30 In. X 26 In. X 55 In.CD-358(FM)*Local Delivery Or Store Pick Up Only. Click Here For Delivery Areas. Complex Desk is available in Black and Beech (shown) Finish. It has wheels, easy to move around. Size: 44.5 In. (W). x 29.5 In. (D). x 51.2 In. (H). Twin Falls Office Desk In Maple Finish. This Desk Features Seven Drawers And A Small Shelf. Also Available (Sold Separately) Matching 2-Door Hutch With Shelves. This Desk Has Plenty Of Storage Space And Is Great For Any Home Office. Strong Construction. Easy To Assemble.Dimensions:Desk: 61 In. x 27 In. x 30 In. (H)Weight:163 LbsHutch: 61 In. x 13 In. x 39 In. (H)Weight: 105 LbsMatching Bookcases Available. See Related Items Below. Drawer Mobile Carts are a perfect add on, especially if you need extra storage. Yes, they too are mobile. 4057 Features: Constructed from durable melamine laminated particle board 8 Roomy drawers Casters add mobility Durable, easy to clean Bead-board panels Stain resistant Easy to clean Matches mobile desk 1017 (Sold separately) Made in the USA Assembly required Finish: Black, White and Oak. Dimensions: 18 In. (W) x 18 In. (D) x 43 In. (H) Item Weight: Approximately 64 lbs. Black Tempered Glass Computer Cart. Easy to assemble. Strong Construction.Size: 31.5 In. (W) x 24 In. (D) x 52 In.(H). Mobile Computer Cart. Available in Light Cherry or Beech. Easy to assemble. Strong construction.30 Wide x 20 Deep x 58 High. Mobil Computer Cart With Strong Metal Frame. Easy to assemble. MDF Light Cherry Finish.Size: 31.5 In. (W) x 24 In. (D) x 30 In. (H).